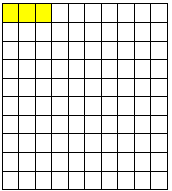 Hundredths place is written in decimal fractions with 100 as denominator. 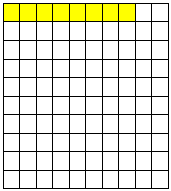 Here we will learn how each square is divided into 100 equal parts. Shaded only one part is known as one-hundredth. In decimal fraction we write it as 1/100. In decimal number we write it as .01 and we read it as point zero one. 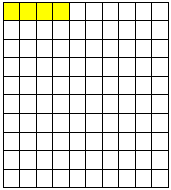 Shaded two parts is known as two-hundredths. In decimal fraction we write it as 2/100. In decimal number we write it as .02 and we read it as point zero two. 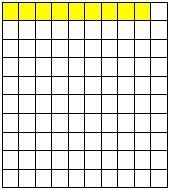 Shaded three parts is known as three-hundredths. In decimal fraction we write it as 3/100. In decimal number we write it as .03 and we read it as point zero three. 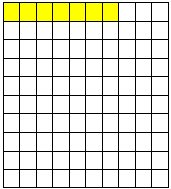 Shaded four parts is known as four-hundredths. In decimal fraction we write it as 4/100. In decimal number we write it as .04 and we read it as point zero four. 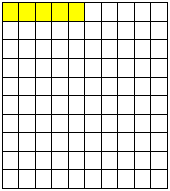 Shaded five parts is known as five-hundredths. In decimal fraction we write it as 5/100. In decimal number we write it as .05 and we read it as point zero five. 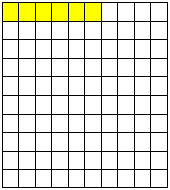 Shaded six parts is known as six-hundredths. In decimal fraction we write it as 6/100. In decimal number we write it as .06 and we read it as point zero six. 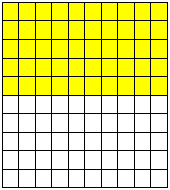 Shaded seven parts is known as seven-hundredths. In decimal fraction we write it as 7/100. In decimal number we write it as .07 and we read it as point zero seven. Shaded eight parts is known as eight-hundredths. In decimal fraction we write it as 8/100. In decimal number we write it as .08 and we read it as point zero eight. 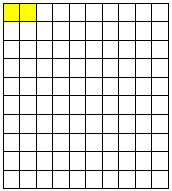 Shaded nine parts is known as nine-hundredths. In decimal fraction we write it as 9/100. In decimal number we write it as .09 and we read it as point zero nine. 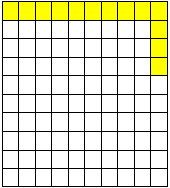 Shaded thirteen parts is known as thirteen-hundredths. In decimal fraction we write it as 13/100. In decimal number we write it as .13 and we read it as point one three. 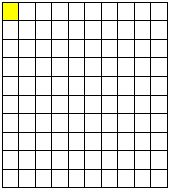 Shaded fifty parts is known as fifty-hundredths. In decimal fraction we write it as 50/100. In decimal number we write it as .50 or .5 and we read it as point five zero or point five. Shaded ninety nine parts is known as ninety nine-hundredths. In decimal fraction we write it as 99/100. In decimal number we write it as .99 and we read it as point nine nine.